There’s no better way to indulge great flavours than doing so while pleasing your other senses. The sight of a masterpiece, the aroma of an exotic specimen, the sound of a soothing installation and the touch of a – well, you’re not supposed to touch, but who says your sixth sense won’t get aroused into action. This month’s Museums Corner invites you to some great dinners at the museums, where your eyes can feast on amazing sights while your taste buds enjoy delectable delights at the table. Whether it’s in an old hospital, a tower overlooking Copenhagen, by the sea or in a black diamond, we’ve got the location to ensure your next meal is one you’ll never forget. 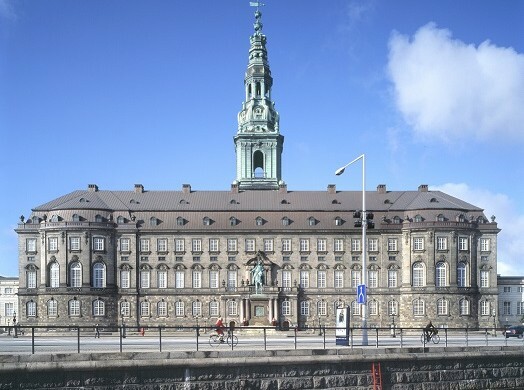 On top of Christiansborg Palace rises the tallest tower in Copenhagen. From up here you can see most of Copenhagen and even Sweden on a clear day. The restaurant is logically called Tårnet (Tower) and serves traditional Danish food such as pickled green tomatoes, raspberries from the backyard and freshly-baked rye bread. Way underneath the tower, actually underground, you can see 800-year-old ruins of the curtain wall from Bishop Absalon’s 12th century castle. And then there’s the Palace Chapel from 1826 with tapestries that show 1,100 years of Danish history from the Viking Age to the year 2000, along with the old royal kitchen. Den Blå Planet houses the eatery Øst overlooking the sea. The spectacular view creates a wonderful setting for enjoying a meal. Meyers Køkken is in charge of the kitchen and that should be a good thing. You might recognise the name from the famous Danish entrepreneur, the chef and former Noma owner Claus Meyer. Apart from the eatery with the unique views, you are of course here to see the fishes, sharks and the otters. The aquarium, which is the largest in northern Europe, holds a stunning 7 million litres of water in its 48 aquariums. Recently two sea otters have moved in – so make sure you say “Hi” to Mojoe and Agnes. Designmuseum Danmark is housed in one of Copenhagen’s finest rococo buildings, the former King Frederik’s Hospital. Today it is a great museum showing the best of Danish, Scandinavian and international design. After enjoying the iconic 1950s furniture of Arne Jacobsen, Hans J Wegner and Finn Juhl, as well as textile prints by Marie Gudme Leth and Japanese design influences, it’s time for dinner. Klint – The Museum Café serves food with a new Nordic twist, and during the summer you can enjoy dinner outside in the peaceful museum garden. The Black Diamond houses the restaurant Søren K where you can enjoy your dinner whilst looking at kayaks and boats drifting by in the harbour. The focus is on Nordic elegance and the good taste of southern European food. Before dinner don’t miss the photo-collage exhibition about architecture, dreams and destruction at the National Museum of Photography, which is also located at the Black Diamond. With its architectonic fusion of old and new, the Black Diamond is the perfect place for this exhibition. Two Danish contemporary artists, Søren Lose and Julie Boserup, have worked with and deconstructed selected photographs from the collection at the Royal Library, building new photographs and telling new stories. The outcome is cool structures and graphic looks.